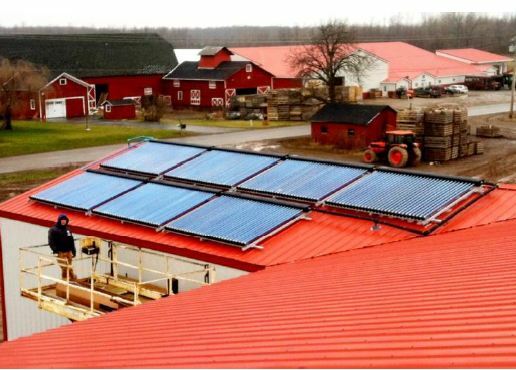 FOR IMMEDIATE RELEASE – February 28, 2012 – Binghamton, NY – SunMaxx Solar, a leading, vertically integrated manufacturer of solar thermal systems and components, is pleased to announce the installation of a solar thermal system at Brightly Farms. Brightly Farms was pleased to purchase a SunMaxx Solar drainback system from Simply Solar Systems that would supply 100% of their hot water needs and about 70% of their heating needs. The system is composed of an 822 gallon non-pressurized storage tank with two heat exchangers: (2) 200′ coils for the radiant floor and (1) 100′ coil for the hot water. The drainback system was plumbed into the heating system using copper, plumbed into the domestic hot water using Pex, and plumbed into the solar collectors using Aquatherm piping. The solar collectors used were the VHP-30’s (Vacuum Heat Pipe, 30 Tube). Fourteen collectors in total were used in this job to maximize efficiency of the system. SunMaxx Solar will continue to develop and help procure the installation of solar thermal systems at farmsteads, plantations, ranches and agricultural estates across the nation. SunMaxx Solar aims to build a sustainable future for our global community. In today’s energy consuming world, SunMaxx offers world-class solar energy and renewable products, striving to meet the increasing need for alternative energy sources. For more information contact marketing@sunmaxxsolar.com.